American test pilot astronaut 1966-1988. Status: Deceased; Active 1966-1988. Born: 1933-11-21. Died: 2014-07-17. Spaceflights: 3 . Total time in space: 20.12 days. Birth Place: Birmingham, Alabama. Hartsfield was an easygoing former Air Force test pilot, quick to laugh or tell a joke in his Alabama drawl. An extreme right-winger, he famously enjoyed taking bowel movements aboard the shuttle when passing over Communist capitals. Nicknamed the Zookeeper on the STS-41-D mission for his supervision of the disparate 'Zoo Crew'. PERSONAL DATA:� Born in Birmingham, Alabama, on November 21, 1933.� Married to the former Judy Frances Massey of Princeton, North Carolina.� Died July 17, 2014 at the age of 80. EDUCATION:� Graduated from West End High School, Birmingham, Alabama; received a Bachelor of Science Degree in Physics at Auburn University in 1954; performed graduate work in physics at Duke University and in astronautics at the Air Force Institute of Technology; and awarded a Master of Science Degree in Engineering Science from the University of Tennessee in 1971. SPECIAL HONORS:� Awarded the Air Force Meritorious Service Medal; General Thomas D. White Space Trophy 1973, 1974;� Inducted into Alabama Aviation Hall of Fame, 1983;� Distinguished Civilian Service Award (DOD), 1982;� NASA Distinguished Service Medals, 1982, 1988;� NASA Space Flight Medals, 1982, 1984, 1985;� NASA Exceptional Service Medal (1988);� Honorary Doctor of Science degree from Auburn University, 1986;� Presidential Rank of Meritorious Executive in the Senior Executive Service, 1996. EXPERIENCE:� Hartsfield received his commission through the Reserve Officer Training Program (ROTC) at Auburn University.� He entered the U. S. Air Force in 1955, and his assignments included a tour with the 53rd Tactical Fighter Squadron in Bitburg, Germany.� He also graduated from the U.S. Air Force Test Pilot School at Edwards Air Force Base, California, and was an instructor there prior to his assignment in 1966 to the U.S. Air Force Manned Orbiting Laboratory (MOL) Program as an astronaut.� After cancellation of the MOL Program in June 1969, he was reassigned to NASA. He has logged more than 7,400 hours flying time -- of which over 6,150 hours are in the following jet aircraft:� F-86, F-100, F-104, F-105, F-106, T-33, and T-38. NASA EXPERIENCE:� Hartsfield became a NASA astronaut in September 1969.� He was a member of the astronaut support crew for Apollo 16 and served as a member of the astronaut support crew for the Skylab 2, 3, and 4 missions. Hartsfield retired in August 1977 from the United States Air Force with more than 22 years of active service but continued his assignment as a NASA astronaut in a civilian capacity.� He was a member of the orbital flight test missions group of the astronaut office and was responsible for supporting the development of the space shuttle entry flight control system and its associated interfaces. Hartsfield served as backup pilot for STS-2 and STS-3, Columbia’s second and third orbital flight tests.� A veteran of three space flights, Hartsfield logged 483 hours in space.� He served as the pilot on STS-4 (June 27 through July 4, 1982), and was the spacecraft commander on STS-41D (August 30 through September 5, 1984) and STS-61A (October 30 through November 6, 1985). From 1986 to 1987, Hartsfield served as the Deputy Chief of the Astronaut Office.� In 1987, he became the Deputy Director for Flight Crew Operations, supervising the activities of the Astronaut Office and the Aircraft Operations Division at NASA’s Johnson Space Center. In 1989, he accepted a temporary assignment in the Office of Space Flight, NASA Headquarters, Washington, D.C.� There he served as Director of the Technical Integration and Analysis Division reporting directly to the Associate Administrator for Space Flight.� In this assignment he was responsible for facilitating the integration of the International Space Station and its unique requirements into the space shuttle systems.� His office also served as a technical forum for resolving technical and programmatic issues. In 1990, Mr. Hartsfield accepted another temporary assignment as the Deputy Manager for Operations, Space Station Projects Office, at the Marshall Space Flight Center, Alabama.� In that capacity, he was responsible for the planning and management of Space Station Operations and Utilization Capability Development and operations activities including budget preparation.� Later in that assignment, he also acted as the Deputy Manager for the Space Station Projects Office. In 1991, Mr. Hartsfield accepted the position of the Man-Tended Capability (MTC) Phase Manager, Space Station Freedom Program and Operations (SSFPO), with a duty station at the Johnson Space Center.� Reporting directly to the Deputy Director, SSFPO, he represented the Deputy Director in providing appropriate program guidance and direction to the Space Shuttle Program, and across the Space Station Freedom Program for all MTC phase mission unique activities to assure appropriate resolution of issues. In December 1993, Mr. Hartsfield accepted the position of Manager, International Space Station Independent Assessment.� In this capacity, he reported directly to the Associate Administrator for Safety and Mission Assurance and managed and focused the oversight activities and assessment of the International Space Station Alpha Program. SPACE FLIGHT EXPERIENCE:� STS-4, the fourth and final orbital test flight of the shuttle Columbia, launched from Kennedy Space Center, Florida, on 27 June 1982.� He accompanied Thomas K. Mattingly (spacecraft commander) on this 7-day mission designed to: further verify ascent and entry phases of shuttle missions; perform continued studies of the effects of long-term thermal extremes on the orbiter subsystems; and conduct a survey of orbiter-induced contamination on the orbiter payload bay. Additionally, the crew operated several scientific experiments located in the orbiter’s cabin as well as in the payload bay.� These experiments included the Continuous Flow Electrophoresis System (CFES), designed to investigate the separation of biological materials in a fluid according to their surface electrical charge.� The crew was credited with effecting an in-flight repair which enabled them to activate the first operational “Getaway Special,” which was comprised of nine experiments that ranged from algae and duckweed growth in space, to fruit fly and brine shrimp genetic studies.� STS-4 completed 112 orbits of Earth before landing on a concrete runway at Edwards Air Force Base, California, on July 4, 1982.� Mission duration was 169 hours 11 minutes, 11 seconds. STS-41D launched from Kennedy Space Center, Florida, on August 30, 1984.� The crew included Mike Coats (pilot), Judy Resnik, Steve Hawley, and Mike Mullane (mission specialists), and Charlie Walker (payload specialist).� This was the maiden flight of the orbiter Discovery.� During the 6-day mission, the crew successfully activated the OAST-1 solar cell wing experiment, deployed three satellites, SBS-D, SYNCOM IV-2, and TELSTAR 3-C, operated the CFES-III experiment, the student crystal growth experiment, and photography experiments using the IMAX motion picture camera.� The crew earned the name "Icebusters" when Hartsfield successfully removed a hazardous ice-buildup from the orbiter using the Remote Manipulator System.� STS-41D completed 96 orbits of Earth before landing at Edwards Air Force Base, California, on September 5, 1984.� Mission duration was 144 hours, 56 minutes, 4 seconds. STS-61A, the West German D-1 Spacelab mission, launched from Kennedy Space Center, Florida, on October 30, 1985. The crew included Steve Nagel (pilot), Jim Buchli, Guy Bluford and Bonnie Dunbar (mission specialists), and Reinhard Furrer, Ernst Messerschmid, and Wubbo Ockels (payload specialists).� The 7-day mission was the first with eight crew members, and the first Spacelab science mission planned and controlled by a foreign customer.� More than 75 scientific experiments were completed in the areas of physiological sciences, materials processing, biology, and navigation.� After completing 111 orbits of Earth, STS-61A landed at Edwards Air Force Base, California, on November 6, 1985.� Mission duration was 168 hours, 44 minutes, 51 seconds. This is the only version available from NASA.� Updates must be sought direct from the above named individual’s family. BIRTHPLACE AND DATE: Born in Birmingham, Alabama, on November 21, 1933. His mother, Mrs. Norma Hartsfield, resides in Birmingham, Alabama. PHYSICAL DESCRIPTION: Silver hair; hazel eyes; 5 feet 10 inches; 165 pounds. EDUCATION: Graduated from West End High School, Birmingham, Alabama; received a bachelor of science degree in Physics at Auburn University in 1954; performed graduate work in physics at Duke University and in astronautics at the Air Force Institute of Technology; and awarded a master of science degree in engineering science from the University of Tennessee in 1971. MARITAL STATUS: Married to the former Judy Frances Massey of Princeton, North Carolina. CHILDREN: Two daughters: Judy Lynn, May 29, 1958; Keely Warren, May 14, 1959. SPECIAL HONORS: Awarded the Air Force Meritorious Service Medal; the General Thomas D. White Space Trophy for 1973 (1974). Inducted into Alabama Aviation Hall of Fame (1983). Distinguished Civilian Service Award (DOD) (1982). NASA Distinguished Service Medals (1982,1988). NASA Space Flight Medals (1982, 1984, 1985). NASA Exceptional Service Medal (1988). Honorary Doctor of Science degree from Auburn University (1986). EXPERIENCE: Hartsfield received his commission through the Reserve Officer Training Program (ROTC) at Auburn University. He entered the Air Force in 1955, and his assignments have included a tour with the 53rd Tactical Fighter Squadron in Bitburg, Germany. He is also a graduate of the USAF Test Pilot School at Edwards Air Force Base, California, and was an instructor there prior to his assignment in 1966 to the USAF Manned Orbiting Laboratory (MOL) Program as an astronaut. After cancellation of the MOL Program in June 1969, he was reassigned to NASA. He has logged over 7,300 hours flying time -- of which over 6,150 hours are in the following jet aircraft: F-86, F-100, F-104, F-105, F-106, T-33, and T-38. NASA EXPERIENCE: Hartsfield became a NASA astronaut in September 1969. He was a member of the astronaut support crew for Apollo 16 and served as a member of the astronaut support crew for the Skylab 2, 3, and 4 missions. Hartsfield retired in August 1977 from the United States Air Force with more than 22 years of active service but continues his assignment as a NASA astronaut in a civilian capacity. He was a member of the orbital flight test missions group of the astronaut office and was responsible for supporting the development of the Space Shuttle entry flight control system and its associated interfaces. Hartsfield served as backup pilot for STS-2 and STS-3, Columbia's second and third orbital flight tests. A three flight veteran, Hartsfield served as pilot on STS-4 in 1982, and was spacecraft commander on STS 41-D in 1984, and STS 61-A in 1985. Hartsfield was the pilot on STS-4, the fourth and final orbital test flight of the Shuttle Columbia, which launched from Kennedy Space Center, Florida, on June 27, 1982. He was accompanied by Thomas K. Mattingly (spacecraft commander) on this seven-day mission designed to: further verify ascent and entry phases of shuttle missions; perform continued studies of the effects of long-term thermal extremes on the Orbiter subsystems; and conduct a survey of Orbiter-induced contamination on the orbiter payload bay. 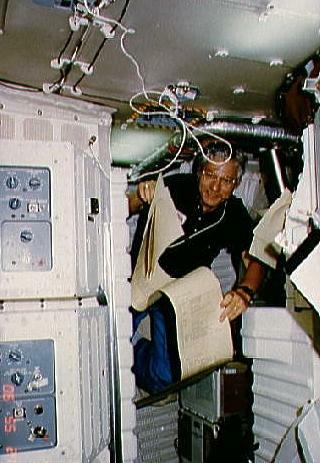 Additionally, the crew operated several scientific experiments located in the Orbiter's cabin as well as in the payload bay. These experiments included the Continuous Flow Electrophoresis System (CFES), designed to investigate the separation of biological materials in a fluid according to their surface electrical charge. The crew is also credited with effecting an in-flight repair which enabled them to activate the first operational "Getaway Special" -- comprised of nine experiments that range from algae and duckweed growth in space to fruit fly and brine shrimp genetic studies. STS-4 completed 112 orbits of the earth before landing on a concrete runway at Edwards Air Force Base, California, on July 4, 1982. 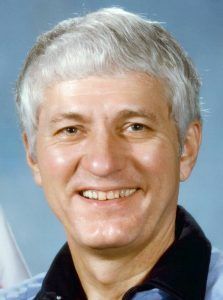 Hartsfield was next spacecraft commander of STS 41-D which launched from Kennedy Space Center, Florida, on August 30, 1984. The crew included Mike Coats (pilot), Judy Resnik, Steve Hawley and Mike Mullane (mission specialists), and Charlie Walker (payload specialist). This was the maiden flight of the Orbiter Discovery. During the six-day mission the crew successfully activated the OAST-1 solar cell wing experiment, deployed three satellites, SBS-D, SYNCOM IV-2, and TELSTAR 3-C, operated the CFES-III experiment, the student crystal growth experiment, and photography experiments using the IMAX motion picture camera. The crew earned the name "Icebusters" when Hartsfield successfully removed a hazardous ice buildup from the Orbiter using the Remote Manipulator System. STS 41-D completed 96 orbits of the earth before landing at Edwards Air Force Base, California, on September 5, 1984. 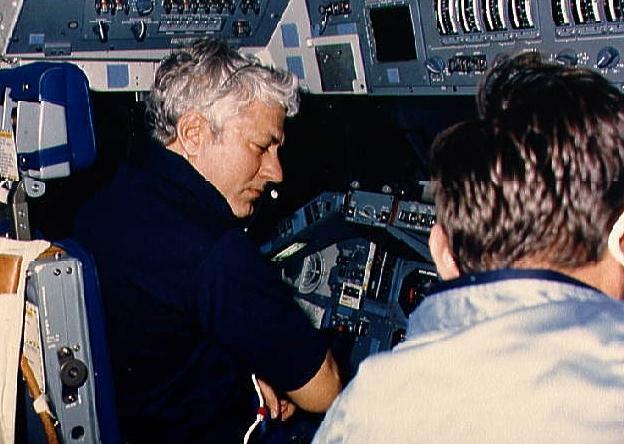 On his third flight, Hartsfield was spacecraft commander of STS 61-A, the West German D-1 Spacelab mission which launched from Kennedy Space Center, Florida, on October 30, 1985. His crew included Steve Nagel (pilot), Jim Buchli, Guy Bluford and Bonnie Dunbar (mission specialists), and Reinhard Furrer, Ernst Messerschmid, and Wubbo Ockels (payload specialists). The seven-day mission was the first with eight crew members, and the first Spacelab science mission planned and controlled by a foreign customer. More than 75 scientific experiments were completed in the areas of physiological sciences, materials processing, biology, and navigation. After completing 111 orbits of the earth, STS 61-A landed at Edwards Air Force Base, California, on November 6, 1985. With the completion of this flight, Hartsfield has logged 483 hours in space. From 1986-1987 Mr. Hartsfield served as the Deputy Chief of the Astronaut Office. In 1987, he became the Deputy Director for Flight Crew Operations, supervising the activities of the Astronaut Office and the Aircraft Operations Division at the Johnson Space Center. In 1989, he accepted a temporary assignment in the Office of Space Flight, NASA Headquarters, Washington D.C. There he served as Director of the Technical Integration and Analysis Division reporting directly to the Associate Administrator for Space Flight. In this assignment he was responsible for facilitating the integration of the Space Station and its unique requirements into the Space Shuttle systems. His office also served as a technical forum for resolving technical programmatic issues. In 1990, Mr. Hartsfield accepted another temporary assignment as the Deputy Manager for Operations, Space Station Projects Office, at the Marshall Space Flight Center, Alabama. In that capacity he was responsible for the planning and management of Space Station Operations and Utilization Capability Development and operations activities including budget preparation. Later in that assignment he also acted as the Deputy Manager for the Space Station Projects Office. CURRENT ASSIGNMENT: Mr. Hartsfield is currently the Man-Tended Capability (MTC) Phase Manager, Space Station Freedom Program and Operations (SSFPO), with a duty station at the Johnson Space Center. Reporting directly to the Deputy Director (SSFPO), he represents the Deputy Director in providing appropriate program guidance and direction to the Space Shuttle Program, and across the Space Station Freedom Program for all MTC phase mission unique activities to assure appropriate resolution of issues. Departed: March 1988. Departed Date: 1988-03-01. Marital Status: Married. Children: Two children. Education: Auburn;Tennessee;Edwards. Family: Astronaut. Country: USA. Flights: Apollo 19, STS-4, STS-12, STS-41-D, STS-61-A. Projects: STS. Agency: USAF. Bibliography: 12, 4457, 5495. 1933 November 21 - . Birth of Henry Warren Jr 'Hank' Hartsfield - . Nation: USA. Related Persons: Hartsfield. American test pilot astronaut 1966-1988. 3 spaceflights, 20.1 days in space. Flew to orbit on STS-4 (1982), STS-41D, STS-61A..
Apollo 19 (cancelled) - . Crew: Carr, Haise, Pogue. Support Crew: England, Hartsfield, Peterson. Nation: USA. Related Persons: Carr, England, Haise, Hartsfield, Peterson, Pogue. Program: Apollo. Flight: Apollo 19. Spacecraft: Apollo CSM. Apollo 19 was planned to land in the crater Copernicus. NASA cancelled Apollo 18 and 19 on 2 September 1970 because of congressional cuts in FY 1971 NASA appropriations..
1982 June 27 - . 15:00 GMT - . Launch Site: Cape Canaveral. Launch Complex: Cape Canaveral LC39A. Launch Platform: MLP1. LV Family: Shuttle. Launch Vehicle: Space Shuttle. STS-4 - . Call Sign: Columbia. Crew: Hartsfield, Mattingly. Payload: Columbia F04 / DoD 82-1. Mass: 11,109 kg (24,491 lb). Nation: USA. Related Persons: Hartsfield, Mattingly. Agency: NASA Houston. Program: STS. Class: Manned. Type: Manned spaceplane. Flight: STS-4. Spacecraft Bus: Shuttle. Spacecraft: Columbia. Duration: 7.05 days. Decay Date: 1982-07-04 . USAF Sat Cat: 13300 . COSPAR: 1982-065A. Apogee: 302 km (187 mi). Perigee: 295 km (183 mi). Inclination: 28.50 deg. Period: 90.30 min. Manned two crew. Fourth space shuttle test flight. Payloads: Induced Environment Contamination Monitor (IECM), Monodisperse Latex Reactor (MLR), Continuous Flow Electrophoresis System (CFES), Development Flight Instrumentation (DFl), Orbiter Experiments (OEX), first NASA getaway special (GAS), Night/Day Optical Survey of Lightning (NOSL) experiment, Vapor Phase Compression (VPC) freezer heat exchanger dynamics for freezing samples, Aerodynamic Coefficient Identification Package (AClP) experiment. 1982 July 4 - . Landing of STS-4 - . Return Crew: Hartsfield, Mattingly. Nation: USA. Related Persons: Hartsfield, Mattingly. Program: STS. Flight: STS-4. STS-4 landed at 16:09 GMT. .
1985 October 30 - . 17:00 GMT - . Launch Site: Cape Canaveral. Launch Complex: Cape Canaveral LC39A. Launch Platform: MLP1. LV Family: Shuttle. Launch Vehicle: Space Shuttle. STS-61-A - . Call Sign: Challenger. Crew: Bluford, Buchli, Dunbar, Furrer, Hartsfield, Messerschmid, Nagel, Ockels. Payload: Challenger F09 / GLOMR 1. Mass: 14,451 kg (31,859 lb). Nation: USA. Related Persons: Bluford, Buchli, Dunbar, Furrer, Hartsfield, Messerschmid, Nagel, Ockels. Agency: NASA Houston. Program: STS. Class: Manned. Type: Manned spaceplane. Flight: STS-61-A. Spacecraft Bus: Shuttle. Spacecraft: Challenger. Duration: 7.03 days. Decay Date: 1985-11-06 . USAF Sat Cat: 16230 . COSPAR: 1985-104A. Apogee: 331 km (205 mi). Perigee: 319 km (198 mi). Inclination: 57.00 deg. Period: 91.00 min. Manned eight crew. Launched GLOMR; carried Spacelab D1. Payloads: Spacelab D-1 with habitable module and 76 experiments. Six of the eight crew members were divided into a blue and red team working 12-hour shifts for 24-hour-a-day operation. The remaining two crew members were 'switch hitters.'. 1985 November 6 - . Landing of STS-61-A - . Return Crew: Bluford, Buchli, Dunbar, Furrer, Hartsfield, Messerschmid, Nagel, Ockels. Nation: USA. Related Persons: Bluford, Buchli, Dunbar, Furrer, Hartsfield, Messerschmid, Nagel, Ockels. Program: Spacelab. Flight: STS-61-A. STS-61-A landed at 18:01 GMT. .
2014 July 17 - . Death of Henry Warren 'Hank' Hartsfield Jr - . Related Persons: Hartsfield. American test pilot astronaut 1966-1988. 3 spaceflights, 20.1 days in space. Flew to orbit on STS-4 (1982), STS-41D, STS-61A..